A pioneer of the modernist integration of architecture and nature, R.M. Schindler extended his Kings Road House design into sculpted landscapes, creating spaces that permeate notions of interiority and exteriority. Concrete walls are translated into well-groomed hedges, while the ground rises and falls like the contraction and expansion of the home’s interior ceilings. Despite Schindler’s rigid control over these forms, I am interested in the physical and primal sense of place that is experienced when visiting this historic structure. The house is a response to a historical tipping point in the power dynamic between shelter and nature that has continued as long as humans have inhabited the earth. Since the Industrial Revolution, architecture has been in a position to return power back to nature. I want to create physical interventions that symbolically and phenomenologically effect an awareness of this power dynamic and recontextualize a historical perspective on survival and meaning, architecture and sculpture. The installations will be located outside in the courtyards. Potential sites have been identified in brown on the plan drawing. 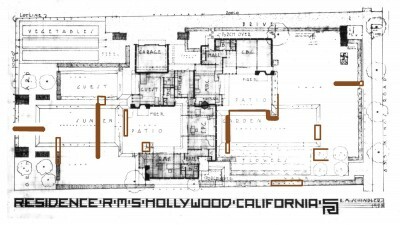 Further analysis of Schindler’s 4-foot grid system, design concepts, and material experiments at the house will be necessary to identify the most ideal locations for the works. 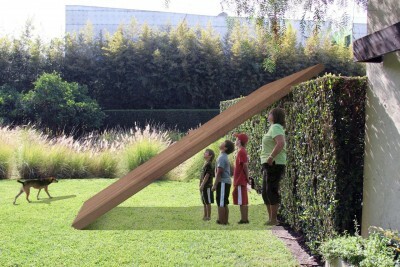 The installations will present a strong visual expression of the tension between nature and design. 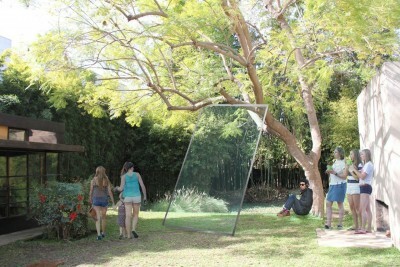 Each sculpture will adopt a particular landscape feature into its site-responsive narrative. The relationship between these sculptural interventions and the meticulously curated land features will challenge the existing balance of the site, intensifying one’s physical relationship to the garden. Each piece, in its construction, will reference the material, proportional, and linear qualities of the house’s design. In one installation, a wooden slab’s base is aligned with Schindler’s grid but is physically reliant upon the structural stability of the hedges. Its form echoes basic shelters of the past and monumental modern sculpture. Dependent upon location, research, and experimentation, the actual placement and final installations will be adjusted accordingly. Nate Page is a Los Angeles-based artist.